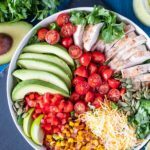 A delicious south west inspired salad full of fresh ingredients and paired with an amazing cilantro lime dressing. Place corn and ¼ c. red onion on a baking sheet. Drizzle with olive oil and sprinkle with salt and smoked paprika. Roast at 425 degrees for 15 minutes. Let cool and set aside. Place all other ingredients in a bowl and toss. Add cooled corn mixture, top with dressing and toss together. Place all ingredients except oil in a high speed blender and blend until smooth. Slowly drizzle oil into blender to emulsify. This salad is great to make if you have leftover rotisserie chicken. If you want to make this vegetarian, you can substitute the chicken with garbanzo beans or black beans.